Are you one of the four out of five people who have experienced back pain at some point in their life*? Back and spine injuries are the most common musculoskeletal problems, which can reduce quality of life, diminish work capacity and restrict activity. The spine is a complex structure of vertebra, disks, spinal cord and nerves. Proper functioning of this core system is critical to many activities of daily living. Actions such as turning, bending, standing and lifting cannot be easily accomplished when you are experiencing pain in this area. BMC orthopedic spine surgeons Drs. Tony Tannoury and Chadi Tannoury are fellowship-trained and board-certified, with experience in all adult spine, back and neck conditions. Dr. Tony Tannoury has pioneered innovative surgical methods and designed some of the most advanced orthopedic surgical instruments used by surgeons worldwide. Exceptional patient care is our number one priority, with a particular focus on accurate diagnosis and providing the most appropriate surgical or nonsurgical treatment. From diagnosis to the development of a treatment plan to postoperative care, we balance the advantages of cutting-edge technology, such as disk replacement and minimally invasive techniques, with more well-known, standard open procedures to develop a treatment plan that is specifically tailored to each individual patient. 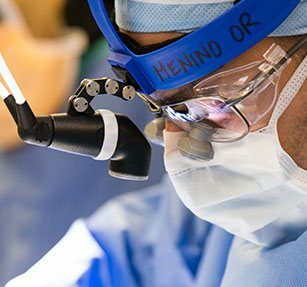 While BMC performs open surgeries, it is internationally known for its pioneering work in minimally invasive techniques, over time expanding the breadth of spine conditions that can be addressed with this approach. Today, the extensive experience of our surgeons enables them to undertake a full range of spine disorders, including many complex procedures―such as revisions, multiple-level disease, fusions, compressions and deformities―using minimally invasive techniques. Read more about how advanced technology offers hope for complex spine cases. BMC surgeons team up with colleagues from other disciplines through all phases of their patients’ care, like emergency and trauma physicians, radiologists and physical and occupational therapists. Spine surgeons in Boston Medical Center’s Department of Orthopedic Surgery are distinguished leaders in advanced minimally invasive surgical treatments for a full range of spine disorders. From an accurate diagnosis to the development of a specialized treatment plan, spine surgeons at BMC draw on surgical expertise and state-of-the-art technology to provide the best possible outcomes for these and many other patients. For Robert, and many patients like him, surgery was the final option, and he ultimately found his way to Tony Tannoury, MD, an orthopedic spine surgeon at Boston Medical Center. Dr. Tannoury has spent his entire professional life developing innovative, life-changing minimally invasive procedures for back surgery to help return patients to healthy, active lives. With minimally invasive procedures, patients have less pain, a faster recovery and a much lower risk of developing infections. “Minimally invasive surgery takes care of the problem without violating other normal structures,” says Dr. Tannoury. Chris, a Somerville police officer who injured his back in an altercation with a suspect and was out of work for 15 months, also found Dr. Tannoury. “I was very impressed that the doctor who was going to operate on my back designed the device he would use to repair it,” he remembers. Physical therapy is always an important part of recovery. Patients who undergo minimally invasive surgery typically have less pain, can start therapy sooner and progress more quickly through the course of treatment. Dr. Tannoury believes BMC is a leader in minimally invasive surgery. “The conditions we address at BMC and scope of surgeries we do surpass what is being done at the vast majority of hospitals in this country,” he says. Jerry, another satisfied former patient, has one wish: that it was more widely known how high the quality of medical care is at BMC.